The Treadstone name has become synonymous with quality intercoolers over the past few years, and we pride our selves on it! We manufacture our bar and plate cores with strict guidelines, and are specifically designed to maximize cooling using the most surface area possible in any given space. Our cores give the perfect balance between heat exchanging efficiency and flow. Our internal fin structure design is top notch, and is where the most important changes can be made to enhance the cooling rate. Treadstone intercooler cores feature a high heat-dissipating "Inner fin" design. This is ideal for medium to high boost levels on higher horsepower or upgraded turbo engines. The larger internal surface area provides superior cooling efficiency for radiating excessive heat and minimizing heat soak. 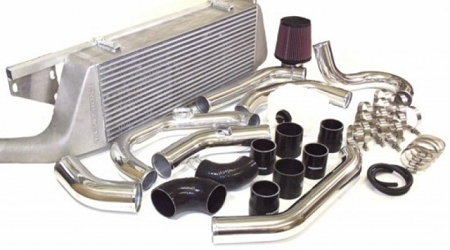 In general, these design characteristics is what gives Treadstone Intercoolers the leading edge in intercooler technology. We give you the options of colored pipes; Suby Blue, Murdered out Black, Crinkle Red, and Polished. All pipes color options are powder coated with a crinkle finish for easy cleaning and to show less smudges and dirt. Color options add $150 to your kit price. You can also choose your color silicone from black, red, or blue great for color matching and customizing, please send email request for color. The pipe kit can also be purchased with your choice of Tial, Turbonetics/Greddy, and HKS flanged blow off valve options! To purchase a BOV with your kit, please see below links. The pipe kit will come with a pre-welded flange, email request must be sent for flange option if you do not purchase a BOV with your kit. NOTE:This is sold as a kit, so you must choose the color pipes, and the color intercooler you want. 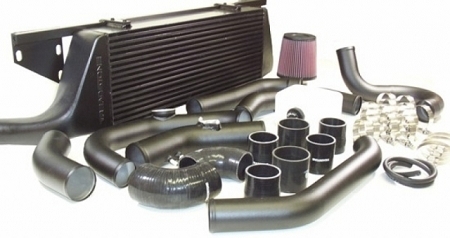 Pics above are show with cold air intake but is not included in pipe kit price. Cold air intake kits with filter are $350 extra.